From the Collector GUI, click on the Connect to Code Central button to bring up the "Connect to Code Central Server" dialog box. 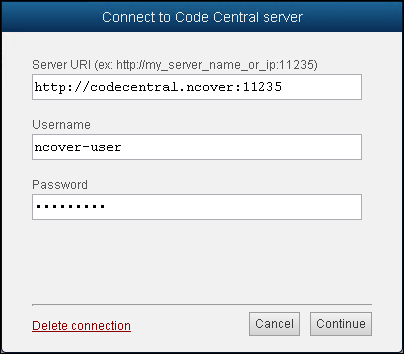 Server - The fully qualified name or IP address, plus the port number (11235, by default) of the Code Central server. This field should contain the same connection string you would use when connecting to Code Central from another machine. Username - From the account created on the Admin page of the Code Central Server. Password - From the account created on the Admin page of the Code Central Server.